Community health centers are not-for-profit, community-governed, patient-directed organizations that often serve populations with limited access to health care. They provide comprehensive, culturally competent, quality primary care services to a diverse population in a wide range of settings. Federally Qualified Health Centers (FQHCs) are not “free clinics” but provide services to all, with fees adjusted based on ability to pay. FQHCs are public and private non-profit health care organizations that meet certain criteria under the Medicare and Medicaid laws and receive funds under the Health Center Program. We know that FQHCs like yours face a broad range of governance and human resources challenges, from establishing the pay of their chief executive officers to recruiting and retaining quality health care providers and ensuring that their entry level staff is qualified, trained and appropriately compensated. With a mission driven by quality patient care, FQHCs sometimes fail to address the human resources issues that can make the difference between day-to-day struggles and fulfilling their missions. Federally Qualified Health Centers have made up the core clients of Merces Consulting since its founding in 1992, and the firm has nearly 50 FQHC clients across the United States, from small organizations with less than $5 million in revenue to some of the largest FQHCs in the country. Merces FQHC clients are found in urban and rural areas and include both migrant-focused and community-focused organizations. We provide FQHCs with a broad range of services that help them run more efficiently, better utilize their financial resources, improve opportunities for their employees, and enhance their ability to provide care. Not-for-profits in many industries are facing scrutiny for their executive compensation programs, and Merces has led the way with the development of a “best practices” approach, providing a method for Boards of Directors to properly fulfill their governance responsibilities. Our salary management programs for providers and staff bring large-company sophistication to any size organization. We help eliminate many of the compensation problems that plague organizations lacking sufficient structure. Below you will find a map depicting some of the FQHCs that have trusted Merces’ services. 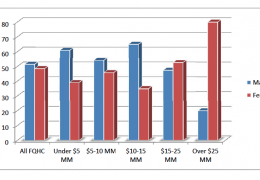 Boards of Directors are appropriately concerned about their CEO compensation programs. The Health Resources and Services Administration (HRSA) has expressed its concern and warned of the need for more transparency and disclosure. State and federal agencies have indicated their intention to come down hard on perceived “excess” executive compensation. Sometimes it seems as if the media has nothing better to do than to “expose” executive compensation practices. We understand the challenges of working with Board members who do not have expertise in the area of executive compensation. All of our assignments include training and presentations to the Board to ensure they understand the implications of their actions and can feel confident in their decisions. Merces offers a complimentary assessment of the strength of the disclosures in an organization’s IRS Form 990. Contact us to find out if you are in a good position or could find yourself on the wrong end of a front-page news article. None of these problems are inevitable. With extensive knowledge and more than 25 years working with FQHCs nationwide – large and small, in urban and rural settings – Merces has more expertise in developing, implementing and administering structured employee compensation programs than any other consulting firm. Our programs reflect the realities of the FQHC environment, including the significant difference between primary care and hospitals, and between the FQHC model and private practices. Internal Equity – A job evaluation methodology determines the relative value of jobs to the health center, ensuring pay opportunities match job contributions, even when no market data is available. A pay program that does not properly incorporate job evaluation is not only less effective, but it also opens the organization up to potential unnecessary liability. External Competitiveness – Defining ranges that clearly outline the pay opportunities for each job helps health centers understand the nature of the market as well as how their “non-benchmark” jobs fit in. Merces ensures that health centers properly define their “market” and collects the data that is most appropriate – not just for their market but for their business model. 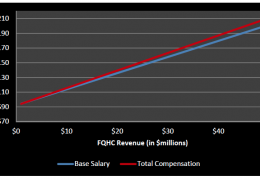 Paying for Performance – A fair and equitable pay program does no good if it isn’t administered fairly and equitably. 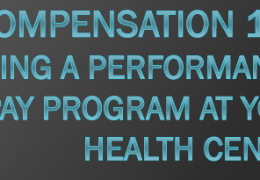 Creating performance management plans that ensure appropriate compensation for employees’ contributions to the health center is key to effective pay management. We can show your organization how to use job descriptions to create customized performance management programs for each job. Helping with strategic planning to make sure human resource implications of proposed strategies are understood. We understand that each organization is different, but that organizations in an industry can learn a lot, not just from each other, but from those in other industries. Effective solutions begin by clearly defining the objectives and expectations and working toward the best possible results. Many human resources programs and other organization initiatives fail, not because they are poorly designed, but because they are poorly communicated. Communication is not simply a matter of volume of information, but also effectiveness of delivery. Any new program – or any change – requires development of a strategy to ensure that information is effectively disseminated to the right population at the right time. The communication also involves gathering information from employees, whether it is for deciding which approach to take, or gauging the reaction to actions already taken.